Pumpkin seeds are packed with nutrients including protein, niacin, zinc, and iron. They’re also a great source of manganese, dietary fiber, and phosphorus. They’re most often included in Mexican food. Roasted pumpkin seeds are a regular snack in the United States during the autumn season. North Americans also used them as a folk medicine. Pumpkin seeds are known to eliminate intestinal parasitic worms. They are great for weight loss because of its high protein and fiber content. If you have trouble sleeping, munching on pumpkin seeds can help you get well-rested. They contain L-tryptophan, which promotes the production of serotonin in your body. Serotonin helps improve your mood and sleep. Pumpkin seeds also help keep the heart healthy. They contain essential fats such as omega-3, which is good for the heart. They’re an energy booster too since they are rich in magnesium. Cut the top of your pumpkin open with a knife. Remove the seeds from the pumpkin. You can do this by hand or you can use a spoon. Separate the seeds from the fibrous pulp. Place the seeds in a colander or a sieve then clean them under cool, running water. Continue the process until they don’t feel slimy anymore. Shake them and place them on a clean cloth towel to dry. If you use a paper towel, the seeds will stick and will be difficult to remove. Now you are ready to dry your pumpkin seeds. Pumpkin seeds are usually dried using an oven or a dehydrator. After drying the seeds in a towel, place the seeds in one layer on a baking or cookie sheet. Set the oven to 170 degrees and dry the seeds for about 3 to 4 hours. If you’re using a lower setting, you can dry them for up to 12 hours. Stir them regularly to make sure that they don’t burn. They’re done once they’re crispy or once they easily break when bent. To boost flavor, you can add some olive oil and salt. You can also toss extra seasonings such as ginger, nutmeg or cinnamon. Return them to the oven and bake for about 15 to 20 minutes. It is important to roast the seeds for only a maximum of 20 minutes. The nutritional value of pumpkin seed fats decreases if seeds are roasted for a longer period. After you clean the seeds, soak them in a bowl of water overnight. Drain and place them on a towel to dry. You can mix the seeds with the following in a bowl, for added flavor: 1/4 tsp Cloves, 1/8 tsp Ginger, 1 tsp Agave, 2 tbsp Olive Oil, 1/2 tsp Cinnamon, 1/4 tsp Nutmeg, 1 tsp Salt. Place dehydrator sheets on the trays. Put the pumpkin seeds in a single layer on each tray. Follow the time and temperature suggested in your dehydrator’s manual. Or, you can set your dehydrator to 150 degrees Fahrenheit. Dry the seeds for 18 to 24 hours. Flip the seeds from time to time to make sure that both sides dry evenly. Use a clean, dry and airtight container. This is important especially if your dried pumpkin seeds are meant to be stored as a snack or as a food ingredient. If placed at room temperature, the seeds can be stored for 3 months. Check them regularly for any sign of molds. Dispose of immediately if you see any mold. If placed in the freezer, the seeds can last for a year. Aside from enjoying dried pumpkin seeds as a snack, you can add them to sauteed vegetables. You can also include them in your burgers or granola recipe. They can be placed on top of your salad or mixed with lemon juice and olive oil for your salad dressing. Remove the baking/cookie sheet with the dried seeds on them from the oven or dehydrator. Place them in a cool area or a place that has about 50 to 60 degrees temperature. Make sure the area is not humid. Keep an eye on the seeds daily and turn them to ensure they will dry evenly and to check for molds. After a month, or once they’re completely dry, place them inside a paper bag or an envelope for storage. You can also use a glass jar or a cardboard container if you need a bigger storage space. It would be helpful if you put labels about the type of pumpkin and the date you started to store them. Dried pumpkin seeds can be stored in room temperature or inside the fridge. With proper storage and room temperature, the seeds can last for up to 6 months. 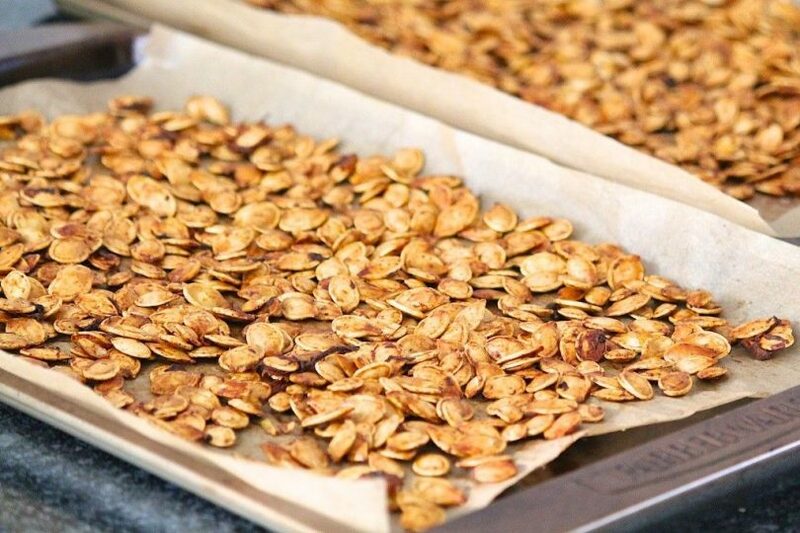 Whether you’re drying pumpkin seeds for snacks or for planting, it’s all worth the effort. The seeds are a gold mine of nutrition. There are many ways to enjoy almost every part of the pumpkin. It’s not surprising that countries such as China, India, Russia, and the U.S. are now major producers of pumpkin and pumpkin seeds. It would be a waste to just throw away even one nutrition-packed pumpkin seed. The best way is to dry them and store them for later use.